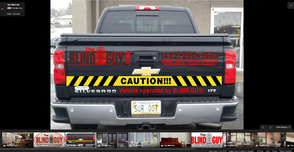 Welcome to The Blind Guy in Elkhorn, the leader in custom window blinds and window shades. For more than 10 years we have provided our satisfied clients with on-site sales and installation of window blinds, vertical blinds, window shades, exterior sunscreens, roller shades, honeycomb shades, Allure transition shades, wood blinds and faux wood blinds and more at competitive prices. Our service, product knowledge, professionalism and workmanship are second to none.